Pension Sebastion was great for our short visit of two nights with the kids. The room was big enough for four of us with a good shower. Breakfast which was included was very nice as well. The walk was only 10 minutes to the heart of the city so it was a great location for us, there was a supermarket, bakery and more on the way to the city if need it. Jan was very helpful and gave good advice when we got there and when we made the initial booking. 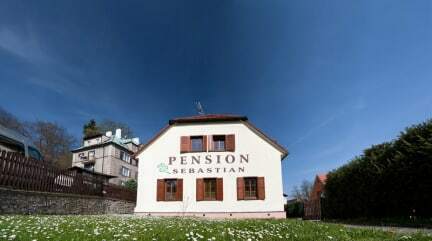 Our family had a simply lovely stay at Pension Sebastian, we had a warm welcome with everything explained in terms of the Pension and Cesky Krumlov. Our rooms were great, just what we'd hoped for, they were spacious and clean, with ensuite bathroom facilities. everything was kept up to a high standard. The breakfast was varied and there was something for everyone. The staff were so friendly and helpful. We booked our journey back to Prague Airport with them, which was very comfortable. Loved it here! Was picked up from the bus stop and was even provided breakfast 1/2 hour before the normal time just so I could be picked up by my shuttle! Lovely friendly staff - highly recommend this pension!! Thanks Jan! Sebastian Pension location is about 10 min walk from the town. There are other accommodation places nearer town if you aren't willing to walk. The place is clean and the breakfast spread was good. Our room faced the road side though so it could get a bit noisy at night/morning with the vehicles zooming past the place. Super cute bed and breakfast! They picked us up from the train station, and were very welcoming! This place is completely handicap unfriendly. Loose carpet at the entry and landing of the stairs. I had advised all the hostels I was staying at that I had recent surgery. So I was given room 7, the room in the attic. It was 30 steps from the front door to my room. The owner was not present but his staff found this situation a great amusement. They offered to help but I told them to bugger off. You could stand upright only in the very center of the room.